Key routes into Nottingham will benefit from even cleaner buses, as just under half of the City’s main bus fleet is upgraded. More than 160 vehicles of Nottingham City Transport’s 330-strong fleet are set to be retro-fitted to clean up their tailpipe emissions, following a successful joint bid from the bus operator and Nottingham City Council. The £2.7m funding, from Defra’s and Department for Transport’s Clean Vehicle Technology Fund, will be used to convert 161 of NCT’s existing, young diesel buses to the latest Euro VI standards, resulting in tailpipe emissions that are 90 per cent cleaner than their current Euro V standard, and would be compliant with a future Clean Air Zone. The City Council, which already runs 58 electric vehicles on its Linkbus services, will use its share of the funding to convert its remaining five diesel buses to Euro VI standard. 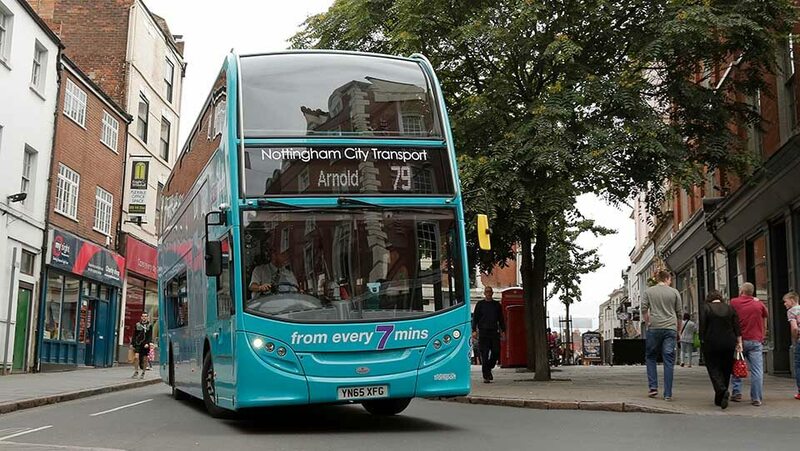 NCT Engineering Director, Gary Mason commented, “Our Euro V buses, which are only between 2 and 7 years old, will have enhanced exhaust treatment systems retrofitted to bring them to Euro VI equivalent, this will result in Nottingham City Transport having one of the youngest and cleanest fleets in the country. Retrofitting diesel vehicles involves fitting a new tank and making alterations to the exhaust. The process will reduce Nitrogen Dioxide emissions by around 63,411kg a year, and emission of Particulate Matter by 488kg over the same period. Key Routes that will benefit include Mansfield Road, Clifton, Carlton, Bestwood, St Anns, Basford Ilkeston Road, Alfreton Road and Derby Road.